Perhaps it’s a Midwestern thing, I don’t know. I grew up outside Chicago (although my family is mostly all from back east) so that’s where my theory originates regarding it being a Midwestern thing. After all, when I was growing up, nobody around me seem to think that it was odd so my assumption is that they all – we all – pronounced it this same way: “new-que-lar.” It was only later, when removed from the wayward influences of my isolated rustic upbringing was it pointed out to me – sometimes amidst unsuppressed laughter – that the word is spelled “n-u-c-l-e-a-r”. Or, in other words, it is pronounced: “new-clear.” Okay, so, whatever. If I’m talking about ‘nuclear this’ or ‘nuclear that,’ what’s shown in the picture above is probably what popped into your head. And that’s fair. This is the way that nuclear power most commonly impacts our daily existence, i.e., through the light switches and electrical outlets in our houses that are ultimately traceable back to a power plant, some of which are based on nuclear fission reactors. 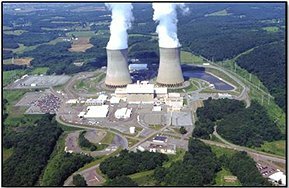 Below are a couple of other applications of nuclear power with which we are familiar. Okay, so what does this have to do with rockets? Well, there are ways to use nuclear power to create rocket propulsion. And, by the way, this is not some newfangled idea out of the blue. Did you know that one of the original plans for the third stage of what would become the Saturn V rocket was for that stage to use nuclear-thermal propulsion? That plan was eventually dropped and a configuration using a J-2 engine was chosen instead, but going all of the way back to the late 1950’s people were thinking of ways to use the extraordinary power of nuclear fission to enable and enhance space exploration. There are two basic classes of rockets that use nuclear fission. One is called “nuclear-electric” and the other is called “nuclear-thermal.” In a nuclear-electric rocket, you use the reactor to generate electricity (like a small power plant) and then use that electricity to make high-velocity ions. The latter portion of the sequence is called “ion propulsion” and there are different schemes and ideas out there, some of which have been used on unmanned spacecraft in the past using other sources for electrical power. Nuclear-electric propulsion is extremely efficient. In the past we’ve talked about specific impulse being a measure of rocket efficiency. Well, a nuclear-electric propulsion system is on the order of ten or twenty times more efficient than your typical high-performance liquid hydrogen / liquid oxygen chemical propulsion rocket such as J-2X or RS-25. BUT (and this is a really, really big “but”), for all that efficiency, they don’t generate much thrust. AND they are very heavy. Thus, the only place where using nuclear-electric propulsion makes any sense is in space. Even there in “weightless” space, the extremely low thrust-to-weight ratio means that this propulsion system is only appropriate for missions where you’re willing to be very patient and get to wherever you’re going quite slowly. That’s not really an appropriate approach for missions with humans on board. The other class of nuclear power rocket engines, and the one that I really want to tell you about, is nuclear-thermal rockets. It is appropriate that we discuss nuclear-thermal rockets in an article immediately following an article discussing expander cycle engines since they are actually closely related. Almost cousins. Below is a schematic for a nuclear-thermal rocket in the same general format as the various expander cycle engines were shown in the previous article. What you don’t have here is any oxidizer. Why? Because there is no combustion. In a normal rocket engine we use fuel and oxidizer in a chemical reaction to create hot combustion products. It is the ejection of those hot combustion products generate the engine thrust. 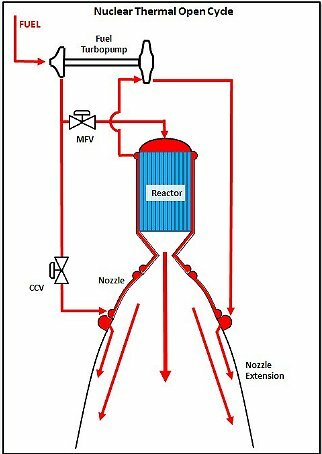 For a nuclear-thermal rocket engine we use the reactor to make the hot stuff. You can think of the reactor, when operating, as a really, really powerful heat source, even more powerful than a chemical reaction. Thus, I can use that heat source to generate turbine drive gas, just as in an expander cycle engine, and I can also use that heat source to make the hot gas that generates the engine thrust. In terms of configuration, the reactor has built into it flow passages where the fuel picks up heat as it goes along. These passages can be along the outside, which I’ve shown here as feeding the turbine, and they are throughout the innards of the core. There are different ways of accomplishing this. One way is to make extrude the core rods with passages – “coolant channels” – through the length of the rods. This is shown in an old sketch from the NASA archives below. Another way to achieve this is to make the core out of pellets or “pebbles” trapped in little cages. Doing this, you’d get what’s called a “pebble-bed reactor” and such a configuration provides for lots and lots of heat exchange surface area between the core pellets and the working fluid flowing through. So, what’s the “fuel” in the rocket schematic, i.e., the working fluid shown in red? The typical answer is hydrogen. One of the reasons that we use hydrogen in a chemical engine is because when we run fuel-rich, we get lots of hot, unreacted hydrogen as part of the exhaust. Hydrogen is very light. When it gets hot and energetic – and hydrogen picks up heat wonderfully – it moves very fast. If you think back to the rocket equation, fast moving exhaust means high performance. In this case for the nuclear-thermal rocket, the exhaust is pure hydrogen, so performance can be quite high. How high? Well, it’s not as high as the nuclear-electric options discussed above, but specific impulse values two times that of J-2X or RS-25 are entirely plausible. Further, despite the fact that nuclear-thermal engines are quite heavy, their thrust-to-weight ratio is generally much better than the nuclear-electric options. In other words, a nuclear-thermal engine has some good “oomph,” enough oomph to make it potentially usable for human spaceflight. And that’s why it was seriously contemplated in the earliest planning for the mission to the moon over fifty years ago. That’s also why, in my humble opinion, it is a prime candidate for any future human mission to Mars. As mention above, this is not a new idea. It reaches all of the way back to the 1950’s. There was a series of active programs all throughout the 1960’s falling under the general heading of NERVA, Nuclear Engine for Rocket Vehicle Application. Below is a picture of an actual test of one of these engines. So, with all this history behind us and with all this potential for performance, why on earth haven’t we been pursuing this technology first and foremost? Because, well, nothing is free and nothing is ever as easy as it seems at first. The biggest struggle with nuclear-thermal rockets is that whole radiation thing. Okay, yes, I said it. Radiation is bad. Deadly. And very long-lasting. While rocket engines of any type always pack a punch in terms of power density and, therefore, the possibility for catastrophe, with the added spice of radiation, you’ve got quite the potential for a noxious stew. Does this mean that we ought to simply avoid it altogether? That’s a valid question and one that’s been debated for about 50 years. It would be presumptuous of me to suggest that I could resolve the issue definitively, but we can discuss the constituent elements rather than just falling back on the “radiation is scary” answer. First, let’s talk about whether it could be used on a vehicle. The reactor is going to generate radiation. Internally, that’s how it works and that radiation in different forms overflows the boundaries of the reactor. It just does. So, what do you do? Well, you provide shielding. The truth is that space is chock full of radiation. If not for our little pocket of safety thanks to the magnetic poles of planet earth, we’d be cooked to the crisp by the radiation pouring out of the sun. When you’re in space, particularly if you’re going beyond our little planetary pocket of safety and traveling to the moon or to Mars, you’re going to get bombarded by radiation so no matter what, shielding is necessary. Shielding is heavy because in order for it to be effective, you need big, heavy molecules to catch gamma rays (my very simplistic explanation). Lead and tungsten are two common shielding materials for this purpose. With a fission reactor, you are also going need something for neutron flux moderation. The typical material for this is Lithium Hydride but the propellant tank itself containing hydrogen also works well for this. A means for minimizing the weight impact for the shielding used to protect the astronauts from the reactor radiation is to use the notion of a shadow. In the sketch below, you have a reactor on the back end of the vehicle, a shield in between, and the spacecraft up front. Between, connecting everything and not shown, would be the propellant tank and the usual shiny structural trusses. As you can see, the shielding creates a shadow from the radiation within which the spacecraft sits. Now, it’s not always this simple because you sometimes need holes through the shield for functional reasons or you could get reflected/scattered radiation effects from structural elements, but this is the most common general scheme for dealing with a reactor on a spacecraft. Stick the reactor out a ways from everything, place the shield close, and cast a long, broad shadow. Okay, you say, you’ve protected the astronauts, great. But what about the six or seven billion people back here on planet earth? After all, in order to fire up a nuclear-thermal rocket in space you first have to get it into space and that means that you have to launch it from the surface of the planet. Launch always involves risk. What happens if the launch vehicle blows up? If the launch vehicle blows up, then the reactor blows up. Wow. Now, how dangerous is that? I will not pretend that I can answer that question with my limited background. But I can tell you that prior to and during launch, the reactor is “cold.” While you probably wouldn’t want to use enriched uranium to make wallpaper for your house, it’s not that horrifically dangerous prior to use in an active reactor. It is only after the reactor gets going that the innards get all juiced up and seriously radioactive. The plan would be to launch the reactor never having been “juiced up” and only start it when it is at a safe distance from earth thereby eliminating as much as possible the potential of reentry of a hot, radioactive reactor into the atmosphere. The next issue to deal with for a nuclear-thermal rocket is probably one of the most difficult: testing. On the one hand, we’ve got lots of places where we can test rockets. On the other hand, we have certain places where we test reactors (mostly under the expert supervision of the Department of Energy in coordination with the U.S. Navy). But putting those two pieces together and playing with them as a unit, now that’s really tough. Why? Because of that darn radiation thing again. After a typical J-2X or RS-25 test, after we’ve cleared residual propellants and bled away any excessive pressures, we’ve got technicians all over those engines. They’re inspecting this, examining that, taking things apart, putting them back together. The whole point of a development program is to get data and a lot of that data comes in the form of post-test inspections. With a nuclear-thermal rocket, that wouldn’t be possible unless you really, really didn’t like your techs (please note that’s not serious, just a joke in poor taste). Once the reactor has been fired up, it’s hot. Yes, you can dial it back down so that it’s no longer at fully throttle, but both it and the surrounding stuff are contaminated to some extent with radiation. And you don’t just wipe radioactivity away with a damp rag. After that first initiation of self-sustaining chain reaction (i.e., “critical”), everything needs to be handled very differently. Also, in addition to this, the hydrogen working fluid that we push through the reactor, it too picks up some level of radiation. No, not a lot. But under modern safety restrictions, all of that hydrogen would have to be captured and scrubbed clean before release. Capturing rocket exhaust is not an easy job. It’s possible but it requires some extraordinary test facility capabilities. With all this difficulty, how can we conceive of getting through a development program? A rocket engine development program requires testing because, frankly, we are demonstrably not smart enough to do without it. One answer: Split the engine into two pieces. If you do the rocket part separate from the reactor part, then you can keep the two pieces blissfully in their natural environments, i.e., the rocket part on NASA test stands and the reactor part in the Department of Energy labs. Focusing on the rocket side (not surprising for me, eh? ), the difficulty then becomes in simulating the heat source that is the reactor. There has been some work done here at NASA MSFC at creating reactor simulators specifically for the purpose of testing subsystem separate from reactors whether those subsystems are rocket engines or power generation systems. 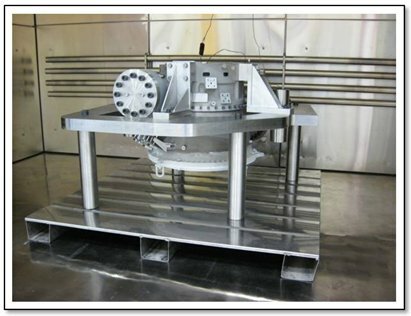 Below is a picture of one such reactor simulator. In this manner you can minimize or possibly even eliminate for the combined rocket/reactor testing that is so difficult to pull off. I’ve had jobs of some flavor almost continuously since I was fourteen years old. From delivering newspapers to cutting grass to flipping burgers to showing movies to mixing giant vats of coleslaw to instructing an aerodynamics laboratory course to hand counting vehicular traffic to researching the derivation of combustion stability equations, before I finally settled into something resembling a career (and while I was winding my way through the maze of secondary and higher education), I did all kinds stuff. But when I did get my first job after graduate school it was doing test data reduction and performance calculations for the Space Shuttle Main Engine (SSME). How cool is that? Trust me: very cool. I consider myself to be extraordinarily lucky in this regard. This article is going discuss engine performance measurements and so it’s going to reach back to my very roots in this business. And that sounds like fun! 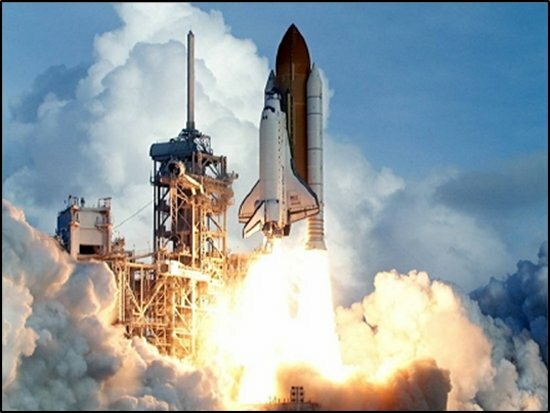 In past articles we’ve discussed rocket engine performance. We’ve talked about the “Big Three” operational points and performance measures that characterize an engine: thrust, mixture ratio, and specific impulse. Okay, but how do we know what these values are for any given engine? I mean, we can do calculations with analytical equations, formulas, algorithms, or models that tell us what these parameters ought to be for a given rocket engine design; but when I’ve got an actual rocket engine sitting in front of me — a big, shiny, complex hunk of metal standing ten feet high and weighing thousands of pounds — how do I know how it actually functions and performs? Well, duh, you test it. Of course! But making smoke and fire (and steam) does not, by itself, give you any data. The most that you could say from just watching an engine test is that it’s really, really noisy and that it makes a really, really big exhaust plume. So, more than just observe, you have to take measurements during the test. That’s how you get data. As I’ve said many times, there are only two reasons to conduct rocket engine tests: (1) to impress your friends, and (2) to collect data. In order to get data on the “Big Three,” you need to measure thrust and you need to measure propellant flowrates. For this article, we’re going to focus on propellant flowrates. I will talk about thrust measurement in the next article. 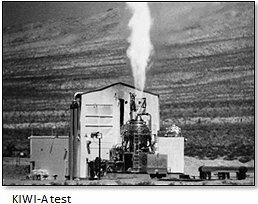 Propellant flows are measured on a rocket engine test stand with “propellant flowmeters.” Makes sense, right? But calling something a “meter for flow” doesn’t tell you how it works. That’s like saying, “How do I make popcorn?” Answer: “With a popcorn maker.” No kidding. Thank you for playing and you’ve conveyed no useful or interesting information. There are a number of different ways to measure fluid volumetric flow. The units that we use for the very large flowrates feeding an engine are turbine flowmeters. 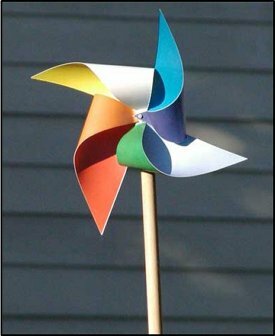 Have you ever blown into a small fan that’s turned off or perhaps a pinwheel? If you blow hard enough, you can make the fan or pinwheel spin. That is, quite simply, how a turbine flowmeter works: it’s a fan, i.e., turbine, stuck in a tube that spins as fluid flows through it. The faster the fluid flows, the faster the turbine spins. The thing that we measure is the speed of the turbine spinning. The turbine has a number of blades (just like that small fan that you blow into). We pick a spot on the tube in which the turbine sits and count how many blades pass by. If we count, say, ten blade passes in a second, then there is more flow than if we’d only counted eight blade passes in a second. So, how do we count blade passes? Well, there’s a little window in the side of the propellant duct and we sit a young college co-op in front of the window with a little hand clicker and scream “GO!” from the blockhouse… Okay, I’m fibbing. We don’t treat our co-ops nearly that bad. Usually. Besides, there would be no way that the human eye and brain could keep up since we’re talking about hundreds of blade passes per second. Instead, we measure it electronically. Each blade contains a magnet in the tip. The sensor on the outside of the tube is activated by the magnet. Each magnet pass generates an electronic pulse or blip — what we call a “pip” — and we keep a continuous count of these accumulated pips. The pip count is then recorded with each time step in the data collection process. Then, after the test, we can translate this ever-increasing pip count into a pip-rate based upon these recorded times. 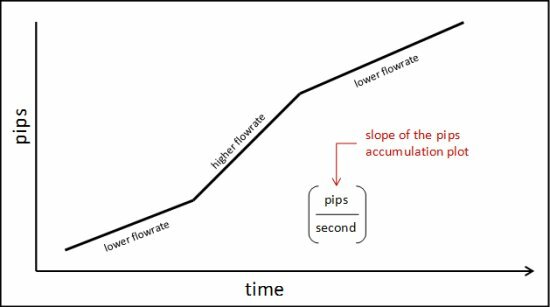 Mathematically speaking, the pip-rate at any given point is the slope of the pip-count plotted against time. The truth is that it’s a bit more complicated in that the calibration varies with the speed of the turbine due to kinetic and mechanical issues of the rotating hardware and due to fluid dynamic effects of the fluid interacting with the turbine blades. However, these are secondary effects as compared to the simple notion of figuring how much a pip is worth in terms of volume. Luckily enough (or, really, strategically enough), the engine test stands are themselves set up to function as a calibration facility for the flowmeters. This is because the propellant tanks have a known geometry and are equipped with fluid level sensors. As shown in the figure above, if we know at a particular time the height of the fluid in the tank and then, at a later time, we know a lower height of the fluid, then, using tank geometry, we know the volume of fluid that exited the tank and ran through the flowmeter. In practice, we actually perform this calibration during an engine test. That way we can be assured that the flowmeter rotor is spinning at a speed representative of where we’ll need measurements. An observant reader would note here that if we know the volume consumed over time just from the level sensors in the tank, then we don’t need a flowmeter in the middle. All you need is volume divided by time, right? The problem is one of fidelity. Because the level sensors are discrete points on the pole submerged in the tank, the measures of volume used for calibration are relatively big chunks, as in enough propellant to run the engine tens of seconds. In order to get a decent calibration across several discrete level sensors, we typically need to run between 100 and 150 seconds of steady, mainstage engine conditions. The use of a calibrated flowmeter allows you to see variations in flowrate at much smaller time increments and this allows us to collect and observe more data with regarding to engine characterization at different conditions. You can almost think of the flowmeter as a useful interpolation tool between large chunks of time and consumed propellant. That is how you measure and calculate the mass flowrate of the propellants flowing through the feedlines and going into the engine using a turbine flowmeter. The item from the “Big Three” to which this can be applied directly is the engine inlet mixture ratio, which is defined as the oxidizer mass flowrate divided by the fuel mass flowrate. However, depending on the engine and vehicle design, not all of the propellants that go into an engine go overboard. Often, warmed propellants are returned from the engine to the stage to act as pressurizing gases for the stage propellant tanks. On the Space Shuttle, both gaseous oxygen and gaseous hydrogen were flowed back to the stage for this purpose. The rocket equation that essentially defines the parameter we know as specific impulse is only concerned with propellants that leave the vehicle so for specific impulse calculations you need to use inlet mass flow minus pressurization flow. As compared to the engine inlet mass flowrates, which for large rocket engines can amount to hundreds of pounds-mass per second, the pressurization flowrates are typically less than one or two pound per second. Flows this small are more effectively measured using flowmeters different from the turbine flowmeters I’ve described above. For our engine testing we use Venturi meters for these small flows. Venturi meters use a variable flow area coupled with pressure measurements to feed Bernoulli Equation relationships between pressure and fluid velocity. Once you know the fluid velocity, fluid density, and fluid flow area at any point, you can then calculate mass flowrate (for now, at least, I’ll not go any further with Venturi meter calculations). This, then, wraps up the story with regards to propellant mass flow measurements and calculations on the engine test stands. In the next article, we’ll go into the measurement of and calculation of thrust. All of this discussion reminds me so much of my first days/weeks/months on the job working with SSME test data. At first, it was just a bunch of bewildering numbers and data reduction tools and rules and calibration factors and work procedures. I had no idea what was going on. But gradually, as I dug into the data and talked to people and dissected the computer codes and tools we used, I began to piece it all together as to what these measurements and calculations actually meant. Seemingly every day brought a new epiphany in understanding. Boy oh boy, that was fun! The first car that I ever owned was a “goldenrod” 1974 Ford Pinto. My uncle Johnny was a car salesman for Buick at the time. He sold new, bright, and shiny machines in his showroom, but, of course, they took in trades of all shapes and sizes and conditions, many of which they would not dare put back on their own lot. My little Pinto was just such a vehicle. I bought it from the obscure and hidden back lot for $500 with absolutely, positively no guarantee that it would continue running until the end of the week. While it was only eight years old, back then (sad to say) autos simply didn’t last as long as they seem to today, particularly if driven hard in the weather of the northeast. So I spent months and months of afterschool hours and weekends replacing rusted panels and floorboards with broad swaths of fiberglass. Also, despite the fact that I was never a true gear-head, I was able to open up the hood and do some work on the engine. It was a straight four cylinders and as simple as could be. You could reach into the engine compartment and easily find and touch just about every greasy major component. Just a couple of years later, my mother bought a new Saab. When I opened the hood of that sleek machine, I couldn’t find anything. The engine was turned sideways, apparently, and the compartment was completely stuffed to the gills with overly clean, boxed-up things that I couldn’t identify, and lines zigging and zagging in all directions. It was fuel-injected and front-wheel-drive and all kinds of other jet-engine craziness that my cozy little, oil-burning Pinto was not. So I closed the hood of that pretty blue Saab and I decided that I’d never make it as a modern mechanic. Why am I bringing this up? Because some of the latest pictures from the assembly of J-2X Engine 10001 reminded me of my confusion in looking under the hood of my mother’s car. Only much worse. Yikes. I’ll get to the progress we’ve made with the big pieces, but first I want to talk briefly about what looks like a chaotic explosion of confusing stuff all over the engine pictures. I will begin by telling you a secret: There are two reasons that we test rocket engines. First, we test rocket engines so as to impress our friends, most of whom are geek engineers like ourselves or people otherwise excited by loud noises made by neato, exotic machines (i.e., lots of NASCAR fans). Second, we test rocket engines to gather data. Lots and lots of data. Many gigabytes of data. We measure pressures, temperatures, rotational speeds, flow rates, and dynamic vibrations both in terms of acceleration and in terms of strain. As part of the development program, we test in order to prove that what we thought was true when we created and analyzed the design is in fact true with the real hardware. And anywhere where we were mistaken, we need to know as quickly as possible so that we can recalculate our margins of safety and, if necessary, make adjustments to the design for the next development engine to be tested. Testing rocket engines is not cheap, and, of course, neither are the engines themselves, but we need to acquire this thorough, unassailable understanding of the engine long before we would ever imagine strapping a human life to something with such awesome power. This need for data explains much of the “bloom” of seemingly ten thousand little lines and wires snaking hither and yon all over the engine. Some of these small lines carry pneumatic pressure for actuating valves or providing purges, but lots of them are related to the many, many measurements we’ll be taking during the upcoming hot-fire test series. In fact, these early development engines will be far more heavily instrumented than any engine we would ever fly because, again, their whole purpose to generate useful data (well, that and to impress our friends). What is truly amazing to realize is the fact that every one of these lines has a specific shape and route; every one of these lines is designed, not randomly configured; and every one of these lines represents a documented step in the assembly process. The first big assembly news to share was the arrival of the regeneratively-cooled portion of the nozzle (usually called the “regen nozzle” around here). In the pictures above, on the left you can see the assembly technicians preparing to lift the regen nozzle out of its shipping container. On the right is a picture of some preparations being made to the nozzle before the rest of the engine is stacked on top. If you’ll remember, the rest of the engine was previously being assembled on a simulator of the nozzle. Interesting little side note: In order for the technician to get into the position you see in the picture on the right, she had to crawl under the elevated assembly platform and stand up inside the nozzle. In the picture below you can see the stack of the engine on the actual regen nozzle. Now, with the regen nozzle in place, lots more stuff could be added to the assembly. 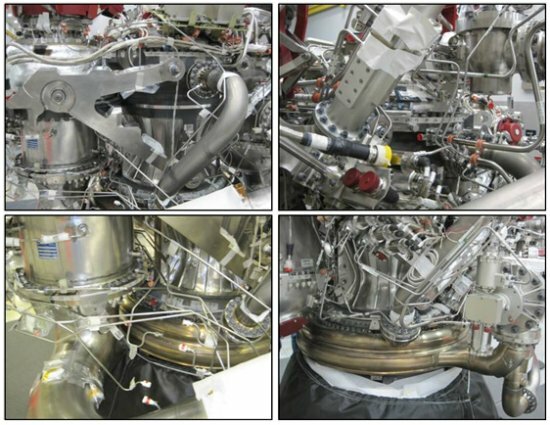 In the collage below, five big items are shown in the process of installation: (1) the liquid oxygen pump discharge duct that carries liquid oxygen from the pump to the main oxidizer valve, (2) the oxidizer turbine discharge duct that contains within it the helium heat exchanger, (3) the turbine cross-over duct that carries hot turbine drive gas from the hydrogen turbopump turbine outlet to the oxidizer turbopump turbine inlet, (4) the main fuel valve, and (5) the fuel pump discharge duct that carries liquid hydrogen from the fuel pump to the main fuel valve. And that’s just a small sampling of the flurry of assembly activity over the last few weeks. I like the fact that I was able to include pictures showing some of the folks working hard to get this thing put together. They’re doing an extraordinary job. The result of all this work is something that is really, truly starting to look like a rocket engine. The pictures below show what you’d see if you took a casual stroll around the engine. Note that the regen nozzle is covered with a black, protective tarp and there are other protective coverings all over the engine, so this isn’t quite as gorgeous as it could be, but for us rocket geeks it’s awfully compelling. With all due respect to the Ford Motor Company and their venerable line of Pinto automobiles, that’s one heck of a leap even if it did take a long time. I just bet that my Uncle Johnny would be proud to think that he was there at the start of the whole thing. 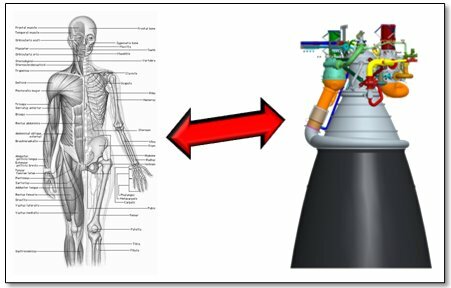 Everyone seems to like analogies between the composition of a rocket engine and that of the human body. These are often colorful but not always helpful. In some cases, however, they work pretty well. Okay, so let’s start with your body as it is. Now, imagine removing all of your bones. Guess what? You’re an immobile lump. Even if your brain is sending signals and your muscles are contracting, you’re not really moving anywhere. This time, let’s instead start with your body as it is, but now imagine removing all of the muscles and tendons that connect the muscles to the bone. You’ve got a central nervous system and you’ve got bones, but with nothing to flex, the chain is broken and you’re stuck where you sit (assuming that you can still actually sit). And, of course, if you instead start with your whole self and imagine removing your brain and/or your central nervous system that connects your brain to your muscles, again, you’ve achieved perfect immobility (i.e., you look like me on Saturday afternoons during college football season). 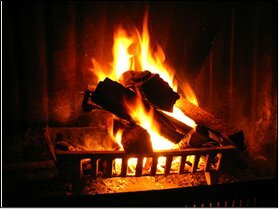 The point is that in order for you to be up and about, shoveling snow, doing laundry, playing pool, typing, whatever, you need both the command center that figures out what signals to send — your brain — and you need things that turn those signals into action — your muscles and tendons and bones. In a rocket engine, the analogue for the brain is the engine controller. It is a computer that receives instructions from the vehicle and sends out commands to the engine pieces so as to fulfill those instructions. The analogue for the muscles are the valve actuation systems. These are the things that “flex” and cause movement. And the analogue for the bones, the final effectors that make things happen, are the valves. The controller sends out signals and then the actuation system responds by shuttling pressurized working fluid — helium for J-2X though some engines use hydraulic fluid instead — where it needs to go so that the valves move and the engine comes to life. The engine goes from being a lump of inert, shiny metal to a “living” beast of flowing propellants, spinning turbomachinery, lots of fire, and thundering, rumbling thrust. On the J-2X, there are 42 valves. Most of this number is made up of small valves like check valves, solenoid valves, and valves in small lines like the bleed lines. There are also a handful of big valves — the primary valves — that directly control the flow of propellant and, in one case, combustion products along the plumbing of the engine. Each of these primary valves is connected to a valve actuator, i.e., the muscle. These valve actuators convert the energy of high pressure helium gas into mechanical rotation of the valve. This is accomplished by pressurizing cavities and moving pistons and, in this way, the valve is pushed opened or closed. 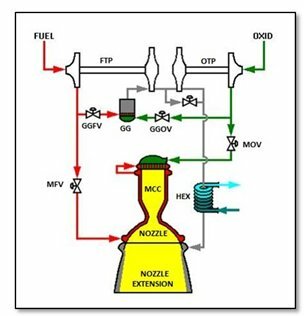 I’ve used this schematic shown below before, but it is useful here as well since it illustrates the primary J-2X valves: Main Fuel Valve (MFV), Main Oxidizer Valve (MOV), Gas Generator Fuel Valve (GGFV), Gas Generator Oxidizer Valve (GGOV), and the Oxidizer Turbine Bypass Valve (OTBV). The control logic for J-2X is relatively simple. The whole subject of different kinds of control logic is a good topic for a future article, but suffice it to say that for normal operation the J-2X: starts on command, can change between two power levels on command, and shuts down on command. The control system is designed to do other things as well, including monitoring the health of the engine, but these operations are the commanded functions. Start and shutdown can be simplistically thought of as: the valves open and the valves close. It’s a bit more complicated since the timing of opening and closing is extremely important, but the open/close notion is basically true. The oddball action is the one consisting of changing power levels. That is accomplished by controlling the power to the oxidizer turbine via the OTBV. This bypass valve effectively allows for limited, independent control of the two turbopumps. By altering the power to the oxidizer turbopump (OTP), you can control the engine thrust level (and, simultaneously, mixture ratio). The OTBV for J-2X is designed and built by Pratt & Whitney Rocketdyne (PWR), the prime contractor for the whole engine. In addition to being responsible for the “oddball action” on the engine of changing power levels, it represents a challenging design due to the range of operating conditions. Unlike the other primary valves on the engine that see, essentially, one narrow range of environmental conditions, the OTBV has to function in temperatures approaching 420 degrees below zero Fahrenheit (liquid hydrogen conditions) immediately prior to start and then, suddenly, within 1 second of ignition of the gas generator, see temperatures approaching 750 degrees above zero Fahrenheit (combustion products). That broad range of operating conditions requires special design considerations and special materials. Not only do you have to worry about wear and tear under such harsh conditions, but you also have to think about simple operation under the extremes of thermal expansion. The original, Apollo-era J-2 engine also had an OTBV, but it was used slightly differently and was designed much differently. It was a butterfly valve whereas the J-2X OTBV is a ball valve. No, the valves shown in the picture are NOT rocket engine valves. I can’t show any internal workings of rocket engine valves. In fact, I am not even allowed to describe the general design details that make the J-2X OTBV kind of unique. However, the basic elements of rocket engine valve functionality for butterfly and ball valves are essentially the same as these water valves. The biggest difference is the replacement of the handles with pneumatically driven actuators. 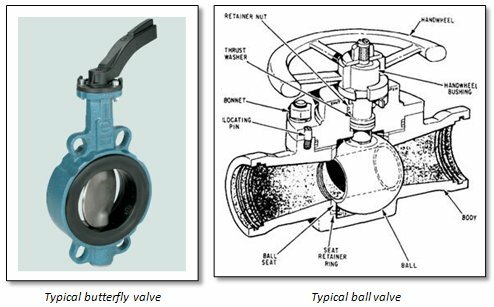 Back during the Apollo era it would seem that butterfly valves were most frequently used, but after many years of usage on the Space Shuttle Main Engine, ball valves are often preferred these days. They generally require less torque to move and they generate better flow characteristics and flow rate control capability. The first OTBV unit for use on the upcoming development engine testing for J-2X is in the later phases of manufacturing at the PWR in Los Angeles. All of the individual piece parts are schedule to be complete by the beginning of February and assembly will begin the middle of February. The valve then will be integrated the actuator and shipped to the NASA Stennis Space Center to be put on the first engine. Lesson learned #1: Don’t argue with Mom. Lesson learned #2: She was right. Any venture as big and complex as Shuttle, or even as big and complex as the development effort for J-2X really does require that everyone does their job well. In that way, we’re all responsible. So, I’m going to introduce you now to just a few of the people (out of hundreds) responsible for making J-2X a reality. Right now I’ll focus on the top leaders Upper Stage Engine Element office here at NASA Marshall Space Flight Center. In another posting, I’ll tell you all about the subsystem managers. And perhaps, later if I’m lucky, I’ll sneak some pictures of the good people out at Pratt & Whitney Rocketdyne as well. First, we have our Element Manager, Mike Kynard. He is a graduate of the University of Alabama [Roll Tide! ], grew up not far from Tuscaloosa, and, to put it mildly, is a devoted fan of Crimson Tide football. 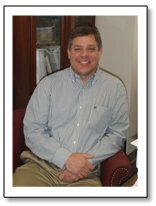 He started working at NASA MSFC as a co-op in college back and accepted a full-time job in 1985. 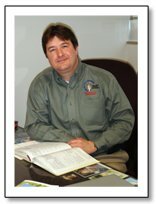 He spent a good spell supporting SSME from the resident office at NASA Stennis Space Center in Mississippi in the 1990s and eventually rose to become the deputy project manager for SSME back in 2004. He has two beautiful little girls and, in addition to everything else, somehow finds the time to play on a team with me in a billiards league. Sometimes, on rare occasions such as a blue moon, he even manages to beat me in a game of 8-ball. Mike’s deputy is Tom Byrd. He is a graduate of Memphis State University who, once upon a time long, long ago was a competitive bicyclist. He started working here at NASA MSFC in 1983 in the area of valves and actuators, specifically supporting SSME (yes, you’ll see SSME as a recurring theme both here and when later tell you about the subsystem managers). Along the way since then, he was a subsystem manager for the Fastrac engine development effort (a NASA MSFC in-house project), was the NASA chief engineer for COBRA engine development effort, and he supported the Shuttle program in the area of systems engineering and integration. Plus, back in 1994, representing the NASA engineering community, he spent a total of four weeks in Russia studying their space transportation technologies. Tom has one young son who, given the uncanny resemblance, we suspect might be the product of a direct cloning experiment … but we don’t talk about that too much. Our Chief Engineer is Eric Tepool. His job is to function as the balance point between technical and programmatic aspects of engine development. He also indirectly functions as a balance in another way, relative to our element manager’s tendencies, in that he is a graduate of Auburn University [War Eagle!]. After making his mark as a star high school athlete, just as his father was a star high school and collegiate athlete, Eric turned down athletic scholarship offers to settle into the pursuit of engineering. 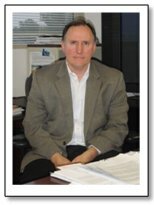 He started at NASA in 1990 in the turbomachinery branch, supported development and certification of the two new turbopumps for the Block 2 SSME configuration, moved on to be a subsystem manager for the COBRA engine development effort, resident manager for the Fastrac project, and the NASA-side lead systems engineer for the Integrated Powerhead Demonstrator project. He has two kids currently in college (one at Alabama, one at Auburn … yikes!) and one soon to be on her way to college. The other “technical balance point,” in accordance with the NASA governance model, is our Chief Safety Officer Phil Boswell. 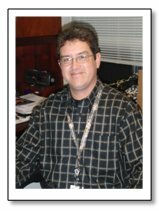 He’s been working here at NASA MSFC since 1985. He started right after graduating from the University of Alabama at Birmingham (UAB). While he started in the Safety and Mission Assurance Directorate, and he’s back there now, in the interim he spent many years working within the Engineering Directorate on such projects as microgravity experiments for Shuttle and the MIR space station, the Orbital Space Plane program, and just about every propulsion element of the Shuttle itself including engines, tanks, and boosters. Phil played on the college tennis team, plays tennis still, and is an excellent golfer. His son, who will be attending UAB starting in the autumn (pre-med) follows in his father’s footsteps and is also an excellent golfer. Little known fact about Phil: he loves swing dancing and even took a year of lessons with his wife. So, that’s the top leadership group for the J-2X development effort. Good guys, hardworking engineers and managers, all around. My background is analytical modeling. There are all kinds of modeling in use today, including some extraordinary computational fluid dynamics and structural dynamics work that is amazing, but back when I did more hands on work I did zero/one-dimensional, system-level modeling of fluid systems, thermodynamics, and heat transfer. Rather than looking at the micro-level, my work was usually a step back at the macro-level. I’ve told you all that because, over the years I found that one of things that I found most challenging and most enjoyable to model is combustion devices. Take the main combustion chamber (MCC) as the prime example. Its job is to contain the combustion, squeeze the combustion products to sonic velocity, and then direct them towards the nozzle. It’s just a big, hourglass-shaped tube. It all sounds simple until you realize that those combustion products are at about 6,000 degrees Fahrenheit and, for the J-2X, at a pressure of over 1,300 pounds per square inch. How it is that the MCC doesn’t melt or burst – or both – is amazing. So, let me tell you a little about MCCs. 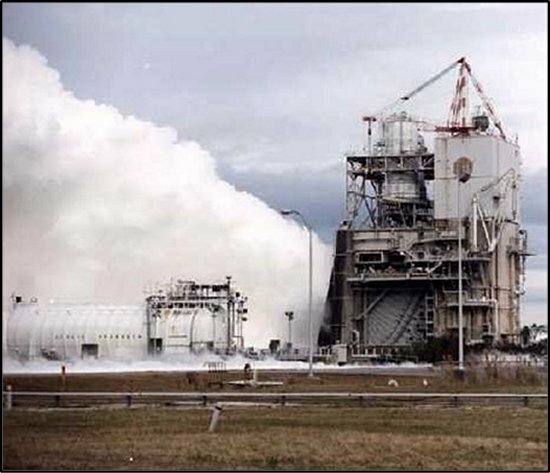 The only way to build one where the walls don’t melt during operation of a large liquid hydrogen / liquid oxygen engine is to actively cool them. This means flowing cold hydrogen inside the walls. 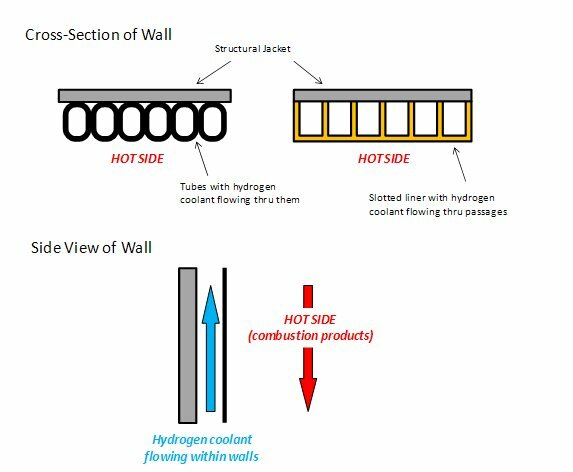 On one side of the wall you have combustion 6,000 degrees and on the other side, you have hydrogen that is typically entering at less than 100 degrees above absolute zero. Now you see why this is a delight for someone who enjoys modeling thermodynamics, fluid flow, and heat transfer. How do you make walls that allow for active cooling? Well, years ago, back during the era of the Apollo Program the walls were made of tubes. They took a whole bunch of tubes, bent them into the profile shape of an MCC, stacked them up into a circular pattern, lay in or pack in binder metal, and then brazed them together. Brazing is essentially a welding process where you stick the whole thing into an oven, make it really hot, and the thing melts together (as someone who enjoys cooking, I tend to think of it kind of like a stiff metal stew). In this case what melts together is binder metal stuck between the tubes so that when you take it out of the oven, you’ve turned several hundred tubes into a single piece. 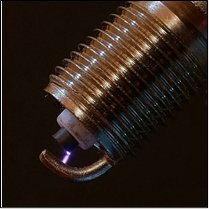 Note that the regeneratively-cooled portion of the J-2X nozzle is made in this manner using tubes, but when doing this with an MCC where the pressures are higher and the temperatures are hotter: we’ve advanced a long way since the 1960’s. First of all, in order to make the tube-wall MCC structurally sound, you were kind of forced to use steel tubes (steel of some sort at least). What you’d really like to use is something like a copper alloy that has higher thermal conductivity properties. Copper tubes might be possible, but you would have to put behind them a steel support structure, a jacket of some sort. That, however, introduces potential issues of hot stuff or high-pressure stuff seeping behind the tubes and causing all kinds of problems including catastrophic failure of the engine. The hourglass geometry required for the combustion products flow path complicates nearly all of the structural issues. Then, along came the development effort for the Space Shuttle Main Engine (SSME). Here you’re dealing with MCC pressures over 3,000 pounds per square inch so you needed a whole new approach since tubes just weren’t going to cut it. What they came up with, conceptually, is the same thing used by J-2X and most other large rocket engines, although the means for fabrication vary. They used a liner and jacket concept. The liner replaced the hundreds of tubes. It is a single piece with the hourglass shape within which the combustion takes place. Around the liner is fitted a structural jacket. 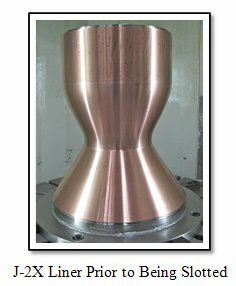 Thus, the liner can be made of something like a copper alloy to deal with the heat transfer issues and the liner can be made of some steel or nickel alloy to deal with the structural issues. Where before the tubes provided the coolant flow path, here groove are cut into the backside of the liner so that when the liner and the jacket are fit together, these grooves become channels. Ta-da! The first step in manufacturing an MCC involves hot spin-forming a copper-alloy forging. The resulting piece is then machined to a precise contour. The liner is then slotted, meaning that the grooves for the coolant flow passages are cut into the backside away from where the combustion products will flow past. The really tricky part about this kind of MCC is making the whole thing fit together and stay together given the different metals being used. The different metals have different properties and different structures at the micro level so a variety of methods including electro-plating and brazing and welding methods are used to make a single unit. It is these details that are proprietary and export-controlled technologies that cannot be revealed but that make the whole thing possible. Luckily, this humble analyst knows little about metallurgy so there is almost no danger of me exposing something useful-but-sensitive to the world at large. In the past, developments for methods of producing a robust bond between the liner and the structural jacket resulted in cheaper, more reliable, yet heavier design. 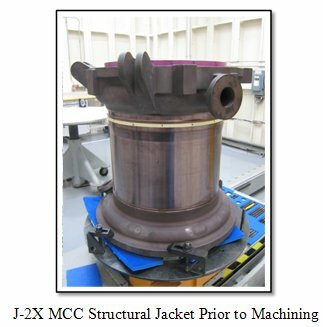 The J-2X design, however, has allowed for significant weight decreases by optimizing the design for post-bond machining. 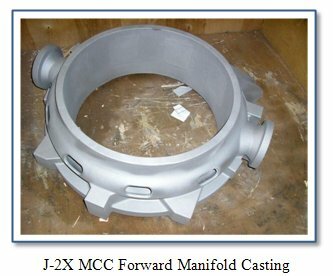 Another recent innovation in MCC fabrication, and one being pursued for the J-2X MCC design, is the use of castings for the manifolds that distribute the coolant to the flow passages and collects the coolant at the end of the passages. These pieces of hardware see very high fluid pressures due to their function as manifolds but also are used by a number of other components for structural mounting into the engine system. Thus, they are heavy and complex pieces. In the past, the typical practice was to machine these parts out of wrought forgings. The J-2X cast manifolds offer a significantly more cost efficient way to produce these parts. 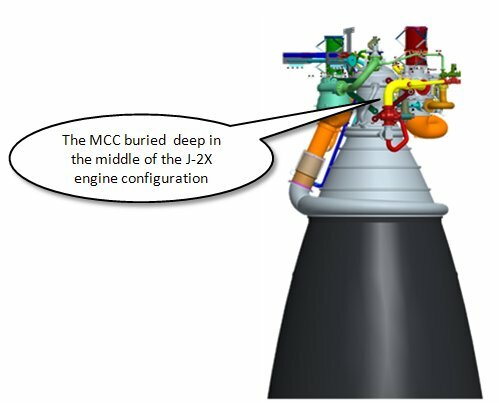 The MCC for the first J-2X development engine is currently planned to complete fabrication in early February 2011. All of the major parts for the second MCC are already in work including the manifolds, the liner, and the jacket. It is slated for completion in July. So now, analytical modelers, like me, will just have to sit back and wait for the testing to commence in a couple of months. Then the process of reconciling models to test results, understanding the clash of approximations and standard correlations and actual, particular physics, starts in earnest. That’s the truly fun part! The previous article for this blog, the one down below regarding progress with the J-2X turbomachinery, was written about 2 weeks ago. There is an inherent lag in the process for big articles. That’s just the way things are. So, that being said, I am tossing a supplemental entry on here to provide an update: The turbopumps for Engine 10001 are assembled! 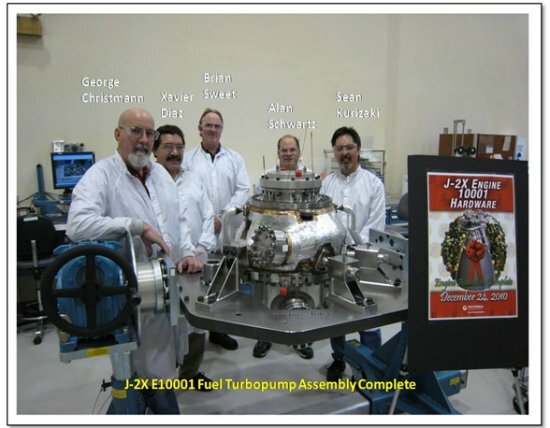 Below is a picture of the Pratt & Whitney Rocketdyne team responsible for assembling the Fuel Turbopump standing around the completed unit. Way to go guys! Welcome back to the J-2X Doghouse. The last time that we met here, we discussed the fundamentals of what exactly makes something a rocket. As I explained, on the conceptual level, rockets aren’t really “rocket science.” You get the propellants together, light them on fire, and eject them out the back end of the vehicle. Simple enough. Okay, but how do you move that much propellant and make that much smoke and fire, enough to propel something as big as, say, the Saturn V that was over 300 feet tall and weighed millions of pounds? That’s where things get interesting and technically difficult. As I said before it is all a matter of power. And to get power you use an engine. What makes a rocket engine an engine is the fact that it contains more than just a combustion chamber where the propellants mix. It is an arrangement of machinery that, once started, feeds and powers itself. During operation, a rocket engine uses some cycle – some circuit of piping and thermodynamics and combustion and valves and control system and rotating machinery – to keep itself up and running and generating thrust. Think about your car engine. You turn the key, the engine gets up and going, and then it can sit there for hours idling, running happily all by itself, converting gasoline and air into mechanical energy, with no additional input from you. You don’t have to manually pump the gas into the injectors (or the carburetor). You don’t have to plug it into an outlet to feed it more electrical energy. It’s self-sufficient until you turn it off or until you run out of gas. That’s what truly makes it an engine. It’s similar with a rocket engine except that the product is not mechanical energy; the product is very fast moving gases generating lots of thrust. For rocket engine conceptual design, in terms of making it an engine, the goal is always, “How do you keep the pumps pumping?” These are extremely powerful pumps moving lots and lots of fluid, so you need some powerful energy source to drive them. The answer is to use what you’ve already got in the engine: the propellants. There are different ways to do this and thus you have different engine “cycles,” i.e., component arrangements. 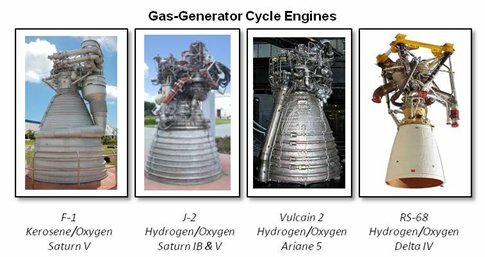 The most common rocket engine cycles are the gas-generator cycle (examples include J-2X, J-2, F-1, RS-68, and Vulcain 2 – see pictures above), the expander cycle (examples include RL10 and Vinci), and the staged-combustion cycle (examples include Space Shuttle Main Engine and RS-170/180). In addition to these, there are many other cycles and variations as well. Each different cycle has advantages and disadvantages and, usually, constraints linked to physics. Choosing the right cycle to fit the mission application is generally the first decision that an engine designer has to make. Because this is a blog dedicated to J-2X, I will focus on the gas-generator cycle engine. Ideally, what you would want to do with a rocket engine is use all of your propellants in as efficient manner as possible meaning that you would want to use all them in the production of thrust. In a gas-generator engine, however, you concede right up front to a loss of some efficiency to achieve greater engine simplicity. You use a certain amount of the propellants brought into the engine almost entirely to keep the engine running rather than for generating thrust. In practice what this means is that you have a separate, small combustion chamber within the engine that does nothing but produce gases to drive the turbines connected to the propellant pumps. As compared to the large quantities of propellants being pumped through the whole engine, the amount going to the gas generator is small (less than 3% for J-2X), but once used to drive the turbomachinery, the exhaust is drained of much of its thrust-generating energy. Below is a simplified schematic of a gas-generator cycle rocket engine like the J-2X. The propellants, liquid hydrogen (fuel) and liquid oxygen (oxidizer), enter the engine and go immediately into the pumps: the fuel turbopump (FTP) and the oxidizer turbopump (OTP). There, the mechanical energy of the spinning pumps is turned into high pressures in the liquid propellants. After exiting the pumps, a small amount of each propellant is tapped off to supply the gas generator (GG). The GG is, in essence, a small rocket engine embedded within the larger rocket engine. It makes hot, high-pressure combustion products, steam and gaseous hydrogen, that are used to drive first the turbine connected to the fuel pump and then the turbine connected to the oxidizer pump. After driving the two turbines, this still-warm gas is used first to warm the helium flowing through the heat exchanger (HEX) that is used to pressurize the oxygen tank of the stage and is then dumped along the walls of the nozzle extension to keep that relatively cool. The video below is a component test of the J-2X GG performed at NASA MSFC. 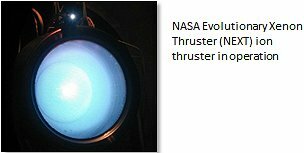 Even with the relatively small amount of propellant that the GG burns, an enormous amount of energy is released to drive the turbopumps. The rest of the liquid oxygen coming out of the oxidizer pump, meaning that which is not going to the GG, is directed through the main injector and into the main combustion chamber (MCC). The main injector is analogous to a fuel injector in a car engine except that here it injects two propellants through hundreds of injector elements. The effectiveness of this injection and the mixing of the propellants are crucial for overall engine performance. The hydrogen circuit after the fuel pump is more complicated. This is because the hydrogen is used to cool the nozzle and combustion chamber walls. The walls of these two components are essentially hollow. They contain hundreds of passages for the hydrogen to flow thereby keeping the walls from melting due to the extreme high temperatures of the contained combustion zone. After doing its job as coolant, the hydrogen is then directed through the main injector and into the MCC. Not shown on the diagram is the fact that a very small amount of the warm hydrogen gas is tapped off prior to entering the main injector and is routed back to the stage to pressurize the hydrogen tank (like the helium through the HEX on the oxygen side). It is in the MCC where the mixed hydrogen and oxygen combust to make steam and residual hydrogen gas. The temperature of that combustion is approximately 6,000 degrees Fahrenheit and in the J-2X the pressure is approximately 1,300 pounds per square inch. These combustion products are then accelerated to sonic velocity at the converging throat of the MCC and then to supersonic velocities down the diverging nozzle and nozzle extension. As discussed previously, it is the high-velocity expulsion of these hot gases that produces thrust. Note that the turbine exhaust gases dumped along the nozzle extension still generate some thrust, but not as effectively as the combustion products that are accelerated through the nozzle throat. This loss of effectiveness is the price that you pay for this relatively simple engine cycle. As a comparison to a more complex engine cycle, do a web search for the schematic for Space Shuttle Main Engine (SSME). 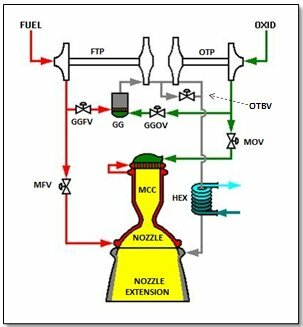 FYI, the other items denoted on that GG-cycle schematic above are the control valves: the main fuel valve (MFV), the main oxidizer valve (MOV), the gas-generator fuel valve (GGFV), and the gas-generator oxidizer valve (GGOV). These primary valves, along with several other minor ones, are used to control the engine during the start and shutdown of the engine. So that’s how a gas-generator cycle engine like the J-2X works. As this blog continues and as we head towards testing next year, I will continue to report on the progress of the components that make up the engine. It was once pointed out to me that most of a rocket engine really isn’t a whole lot more than a jumbled bunch of specialized plumbing. Notable exceptions to that general rule are the engine controller — the brain of the engine — and the rotating components, i.e., the turbomachinery. Of course, the person who was telling me this was a turbomachinery person, which means that I cannot entirely concede the point lest I yield my traditional posture of giving them a hard time. But there is no denying that rocket engine turbopumps are truly remarkable pieces of machinery. What is a rocket engine turbopump? Typically, and this is true for J-2X, a turbopump consists of two parts: a turbine and a pump (hence the name). Pump portion is what draws in the propellants into the engine the pushes that fluid through all of the “plumbing” that leads, ultimately, to its fiery, thrust-generating expulsion. The turbine portion is what provides power to drive the pump. The turbine converts the power of hot gases into the power of rotational machinery. The pump converts the power of rotational machinery into fluid power otherwise known as pressure (thousands of pounds-force per square inch) within the propellant being pumped. 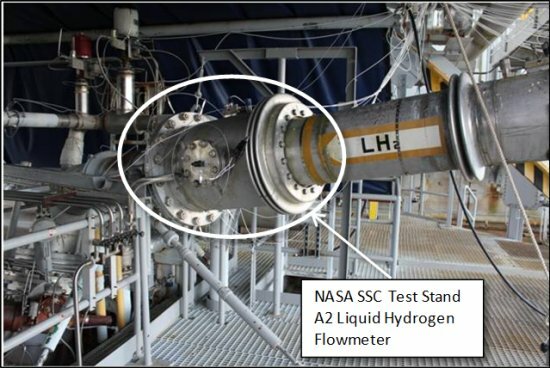 For J-2X, there are two turbopumps: one for pumping liquid hydrogen (fuel) and one for pumping liquid oxygen (oxidizer, or often called “LOX”). Soon, I will be writing an article for this blog that further explains the system-level workings of a gas-generator-cycle rocket engine like J-2X. So, stay tuned. 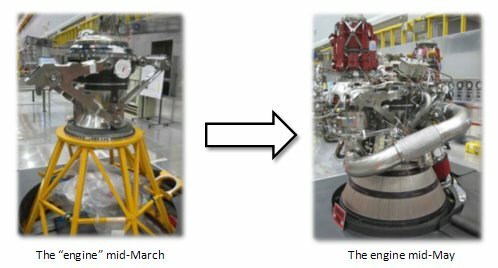 Recently, the Pratt & Whitney Rocketdyne (PWR) / NASA turbomachinery team has made significant progress toward completing the final assemblies of the hydrogen and oxygen turbopumps for the first J-2X development engine (E10001). The first two images show two major milestones for the liquid oxygen turbopump. In the first picture, the turbine-end manifold (top of the photo) is shown being mated to the pump-end volute that is secured in the build dolly. The second picture shows that the oxygen turbopump has now been flipped over with the pump end now near the top of the image and the turbine manifold below. 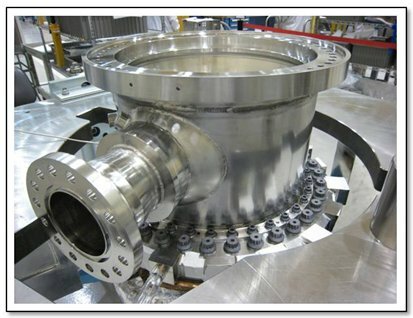 It is sitting in an oven where it underwent a drying operation after successful insertion of the first-stage turbine disk and the turbopump shaft. The hydrogen turbopump has also made good progress by completing all pump-end assembly operations and the turbine manifold installation. 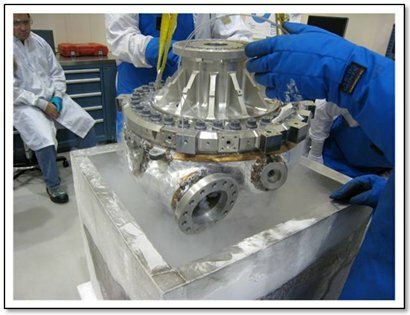 The first picture of the fuel turbopump below was taken after the successful assembly of the impeller into the bearing support, and subsequently that bearing support assembly being installed into the pump end volute, which has been chilled in cryogenic liquid nitrogen. The nitrogen was used to create the proper fit for the volute and the bearing support to prevent hydrogen leakage under engine operating conditions. The process of (1) chilling one metal piece so cold that it shrinks, (2) heating another metal piece so warm that it expands, and (3) then fitting the two pieces together in those states is a process used throughout engine assembly on many different components. It is a means for accomplishing an “interference fit” (also called a “compression fit” or a “press fit”), which means that the two parts, machined to their appropriate tight tolerances, would otherwise not quite fit together — almost but not quite. At room temperature, the pieces would interfere with each other if you tried to push them together. The chill/heat process during assembly allows them to fit together very, very tightly. 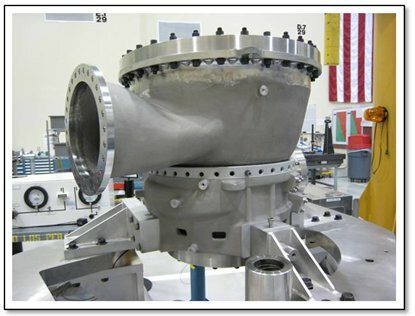 The second fuel turbopump picture below shows the successful installation of the turbine manifold onto the turbine bearing support representing a major milestone in the assembly process. In the beginning of this article, I told you that rocket engine turbopumps are remarkable pieces of machinery. Yet, what I have shown you in the pictures are mostly images of shiny-metal external pieces, big hulking manifolds and volutes. For reasons largely having to do with export control considerations (Rule #1: blog author does not go to prison! ), I cannot show you pictures or detailed schematics of the inner workings. I can describe them by saying that on the pump side you have an inducer, which looks like a fluid screw, and that feeds an impeller for a typical centrifugal pump. On the turbine side, I can tell you that there are two rotating disks of turbine blades and, effectively, two rows of stationary blades called stators or nozzles. And in between the pump ends and the turbine ends are a series of seals that separate the two ends. Ideally, the only contact between the pump and turbine ends would be the mechanical power of the rotating shaft. To give you a better appreciation of the “remarkable” aspects of these units, let’s consider these machines in terms of their output. In terms of horsepower, the table below compares various machines with which you are likely familiar. At only 30 inches long and 20 inches in diameter, the J-2X hydrogen turbopump produces an incredible 16,000 horsepower. This power level is equivalent to more than 120 automobiles, or 90 light aircraft, or even 5 diesel-electric locomotives. In terms of energy generated in a small package, the J-2X fuel pump provides almost as much power as a large aircraft engine on the Boeing 747. 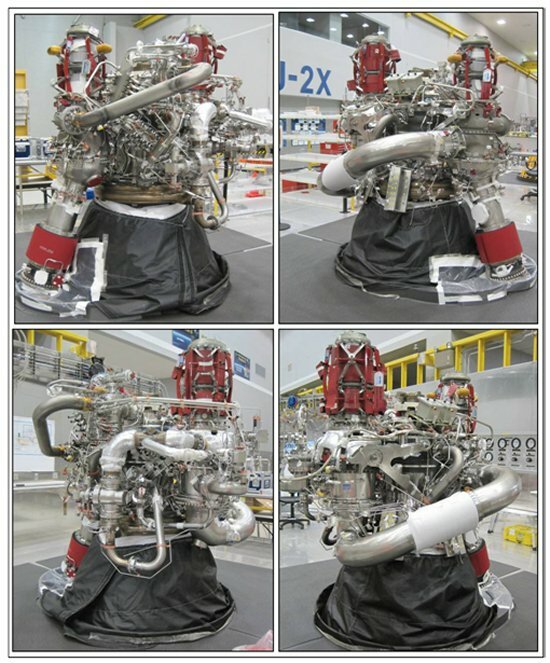 The two turbopumps for the first J-2X development engine are currently on track to complete assembly in December. These units will then be boxed up, shipped to NASA Stennis Space Center, and await engine assembly. So, the first development engine coming soon! And then, it’s on to testing! 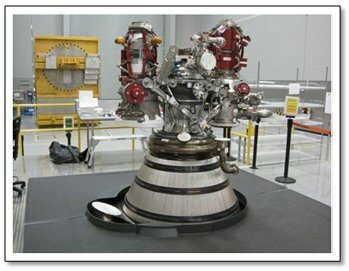 Note that thanks are due to Jeff Thornburg, Upper Stage Engine Element Deputy Turbomachinery Subsystem Manager, for providing the largest portion of the technical updates and pictures that informed this article.